More Snakes! Grab Those Fabulous Snake Boots! 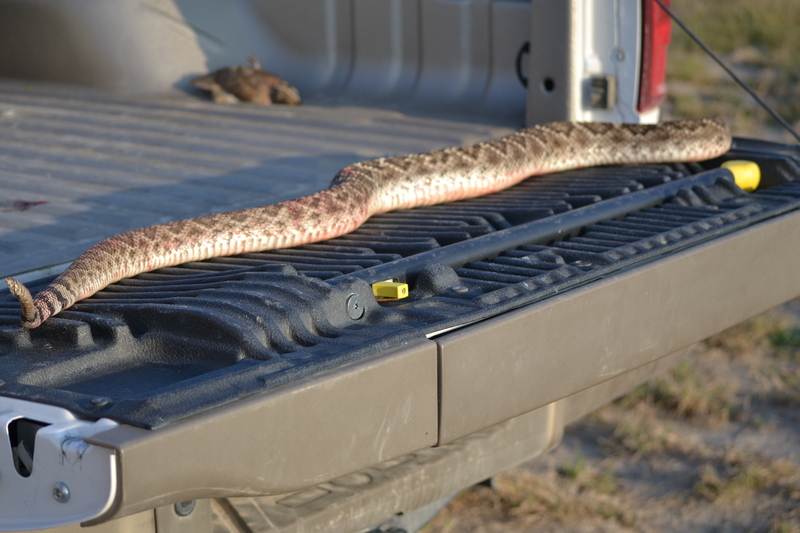 In the two years that we’ve been hunting at the ranch in South Texas, Deerslayer has killed 4 sizable rattlesnakes, the one pictured being the smallest. Living with snakes is just part of life down here. 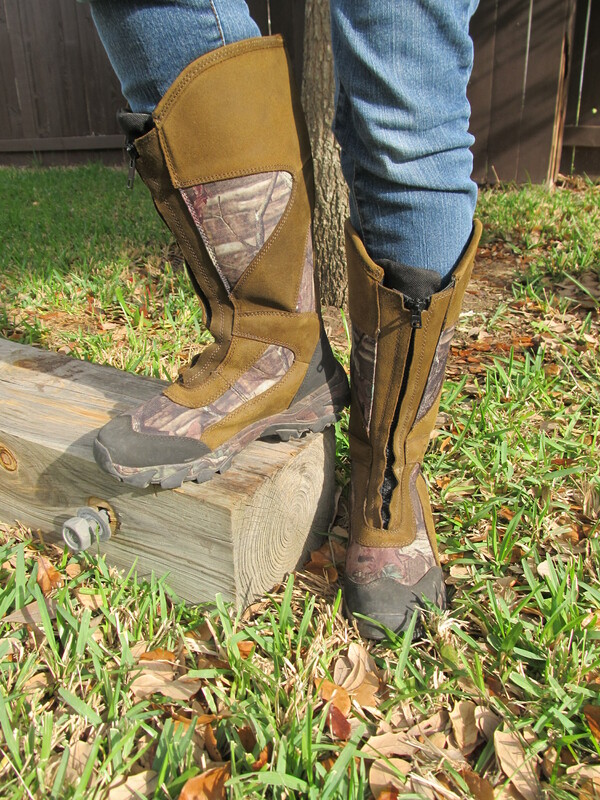 It was after finding the first and largest rattler that the fine line between fashion and function became blurred to include Cabela’s jaunty and ever-so-chic snake boots. I’ve come to appreciate the rich earth tones, the fashion-forward suede and zippered accents, the fact that I can walk through the grass and not be killed by a snake bite.. I suspect that in earlier times, I wouldn’t have been considered one of the “fittest”. 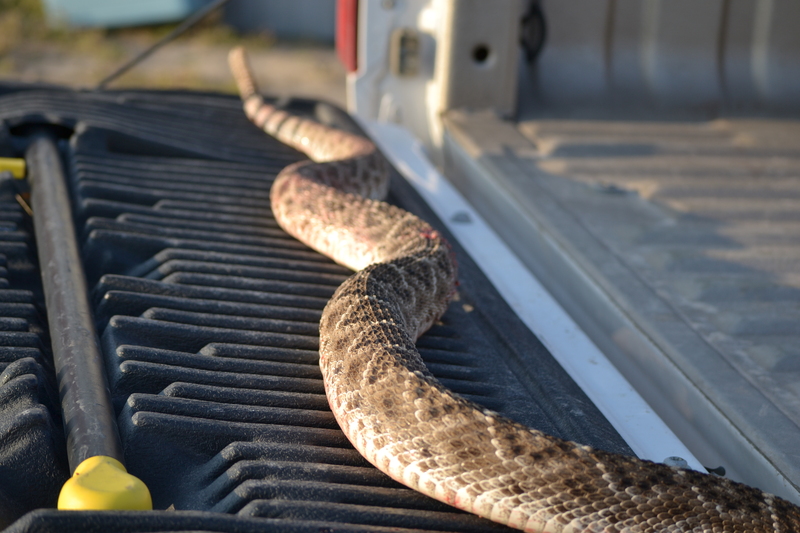 Back to our most recent encounter, before Snakeslayer placed the slithering monster in the back of the truck, the head was removed. While I’m sure everyone knows this already, it bears repeating: A dead snake is just as dangerous as a live one as long as the fangs are intact. People have suffered serious injury and, I’m sure, even death as a result of snake bites from snakes that were already dead. 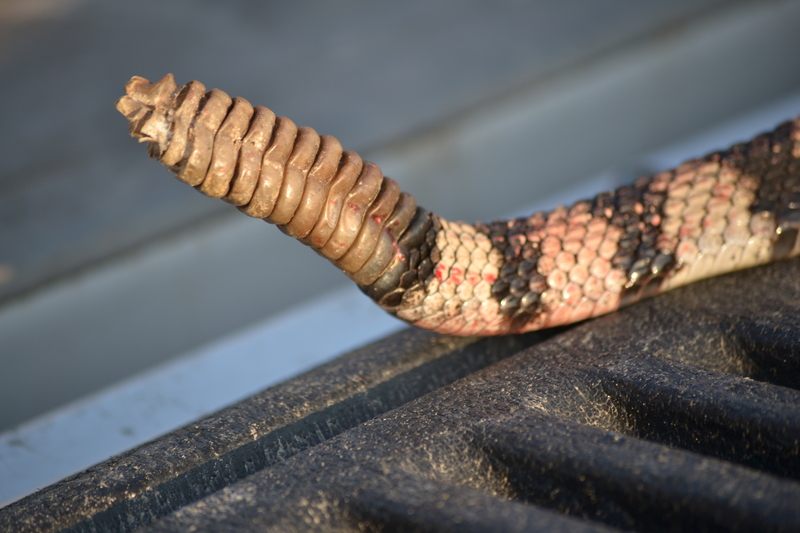 Don’t mess with the head of a venomous snake even after it’s dead. The mouth can still open of its own accord. Nasty business, just don’t! That said, let me continue. 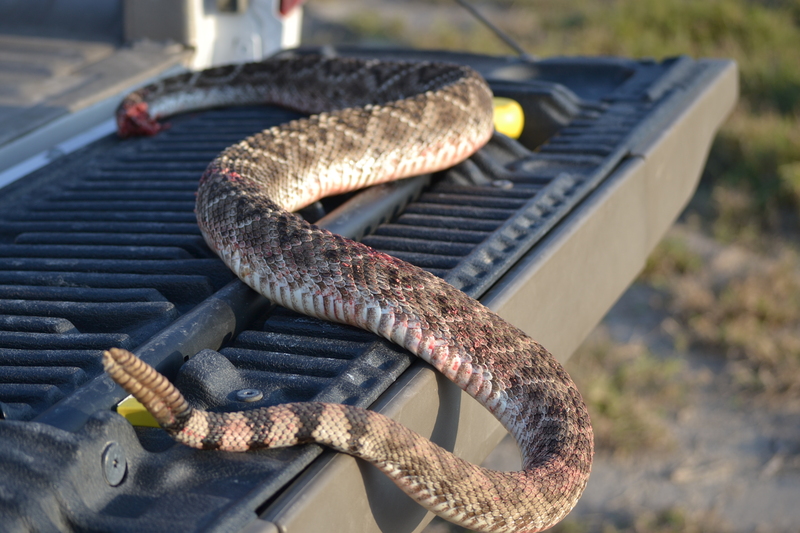 The rattler continued to writhe and thrash about, headless, for at least an hour and a half. With the tailgate down, it slithered off the back of the truck. When Snakeslayer decided to save the skin, there was quite an episode. The decapitated snake thrashed, and wrapped itself around my beloved’s arms as it was being “dispatched”. My job in the proceedings was to gesticulate wildly and suggest poking it with a stick or perhaps run over it with the truck, or shoot it again. It made for interesting stories to share at the hunting camp that night. 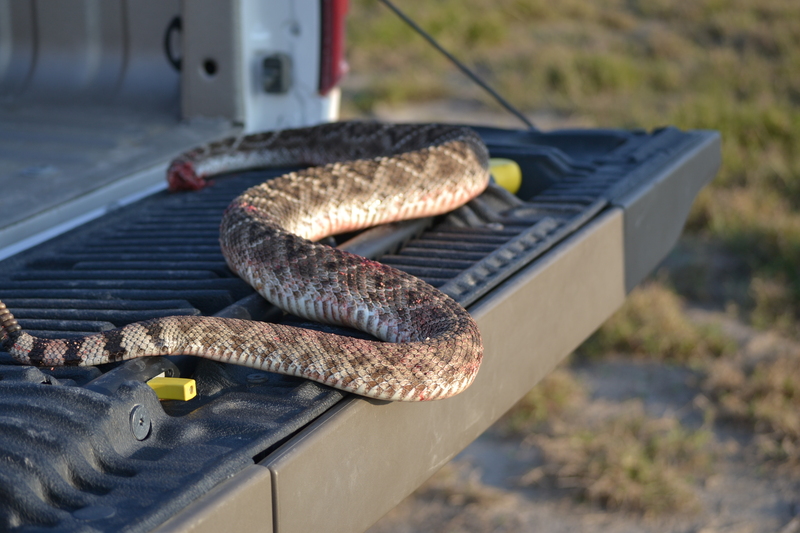 I was asked by several of the other hunters whether I was going to cook up the snake. I guess I better start looking for recipes. Everyone had their own stories to tell. Eyes got big, smart phones were brought out and pictures passed around. Arms stretched in all directions to indicate size and length. When referring to snakes, I guess size really does matter. There’s just something about big snakes that reminds us of our place in the grand scheme of things. Thank God for snake boots!